Did you know, 95% of a flea infestation is in the home? Yes, the fleas you see on your pet only make up 5% of the problem. In the Beaphar office, one of the most common enquiries we get is ‘I’ve treated my pet for fleas, but it’s not working.’ But when asked if they’ve treated the home, the answer is generally no. Why do I need to treat my home for fleas? Some people believe that having a home flea infestation is a sign of a dirty or unclean house, but this is a myth. 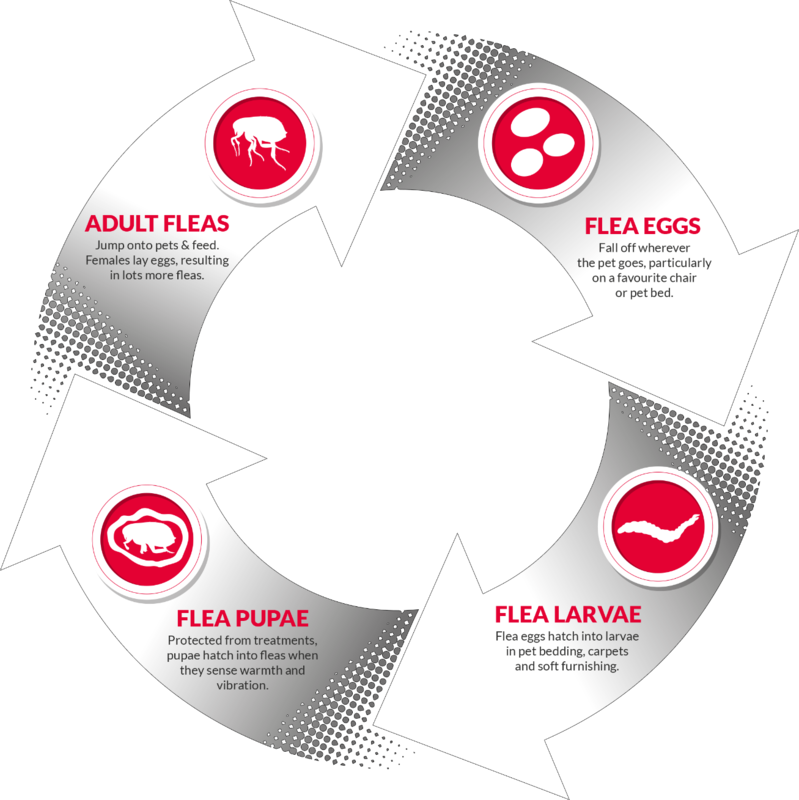 Understanding the flea lifecycle is a key part of understanding why you should be protecting your home as well as your pet. The fleas you see on your pet are the adult fleas, who jump onto your pet in order to feed and mate. The female flea is a prolific egg layer, producing on average 20 eggs per day and up 500 eggs in her lifetime. These eggs will fall from your pet’s coat onto the floor, bedding or furniture. The eggs hatch into larvae, and will crawl deep into cool, dark spaces like your carpet or skirting boards. The larvae then spin themselves into an impenetrable cocoon called a pupa. The pupae will lay dormant, only hatching into adult fleas when a food source walks by, either animal or human. So, while treating your pet may kill the adult fleas, any eggs already existing in the environment have the potential to grow into adult fleas, which will then jump back onto your pet, and the cycle will begin all over again. The only way to truly get on top of a flea infestation is to treat your home as well as your pet. What should I use to treat my home for fleas? When treating your home, we recommend you look out for household flea treatments which combine insecticides with Insect Growth Regulators (IGRs). Such products have a dual action effect - the insecticide kills the adult fleas while the IGR interrupts the flea lifecycle. When an adult female flea comes into contact with an IGR any eggs she lays will be unable to mature, while any eggs or larvae already in the environment will also be affected in the same way. This prevents the flea lifecycle from continuing, reducing the number of fleas in your environment and allowing you to get on top of a flea problem much more quickly. Beaphar FLEAtec and Beaphar Household Flea Fogger both include IGRs, and can protect your home from fleas for up to six month. Due to its long lasting action and easy application, we recommend using Beaphar FLEAtec as a preventative measure. If treating your home for an existing flea problem, whether you’ve selected a product with or without an IGR, it is recommended that you vacuum regularly. The vibrations from the vacuum will encourage any flea pupae (which are protected from all forms of household flea treatment while in their pupal cocoon) already in the environment to hatch into fleas, at which point they will be killed by the treatment. Flea eggs are shiny and smooth, and will fall from your pet and land wherever they go, even your bed or sofa. It is essential that you don’t forget to treat your pet’s bedding and your furniture as well as the rest of your home. Alongside being suitable for treating the home, Beaphar Defest can be used on pet bedding and soft furnishings. It is an easy to use aerosol which kills fleas and larvae. What else can I do to protect my home from fleas? As well as treating both your pet and your home regularly to guard against fleas, you can also vacuum floors and soft furnishings regularly, and wash both yours and your pet’s bedding in the washing machine at the hottest setting possible. Although it may seem odd, when dealing with a home flea infestation it’s very important to allow your pet access to all their normal places. They are a flea’s preferred host, and their presence will stimulate flea pupae to hatch out, so they can be affected by your flea treatment. Why not check out Beaphar’s 5-step plan, which is effective for fighting existing flea infestations and preventing future flea problems.